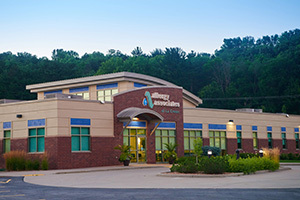 Allergy Associates of La Crosse, Ltd. is an internationally-recognized allergy clinic that helps you identify and treat the causes of your allergies — not just the symptoms — through comprehensive diagnostics and allergy drops taken under the tongue. Today, we continue to lead the way in innovating how sublingual immunotherapy is changing outcomes for allergic patients across the country. Since 1970, we’ve used this safe, effective, well-researched approach to allergy treatment, also known as sublingual immunotherapy, to help patients throughout the country take control of their allergies. Our Protocol, known as the La Crosse Method™ Practice Protocol, is recognized as a leading, comprehensive standard of care throughout the United States. Today less than five percent of allergy sufferers receive the benefit of immunotherapy, the only disease-modifying treatment approach for allergies. Our clinic mission is to offer an alternative approach to allergy shots so that more allergy sufferers can benefit.